We’re checking in with E3Live employee Andrew after he finished weeks 4 & 5 of his E3Live NEW YOU 60-Day Challenge. He’s doing the Insanity by Beachbody workout and taking E3Live superfoods for 60 days. How are you feeling Andrew? Ending week 4 and 5, i feel pretty good. After week 4, I was pretty tired physically. Luckily week 5 of Insanity is a somewhat of a break. There is still cardio and balance, but it is a light load. I feel pretty good mentally, I have court coming up soon for divorce proceedings and I feel pretty good about it. I think it is due to the products I am taking from E3Live and the exercise that I am getting done. I feel like I am getting my body back to were it was – which I think also helps my mind emotionally. I haven’t deviated from it. Sticking with my normal diet. Any changes you notice since taking E3Live products? Throughout this insane workout, I have not had any knee issues like I have had in the past, my shoulders have not been popping and cracking, and I attribute this to the benefits E3RenewME. I take 4.8 grams of RenewME everyday or 6-800mg capsules. E3RenewME really helps to support my joints and body aches! Andrew, an E3Live employee, is doing a 60 Day Challenge using E3Live products and doing the Insanity by Beachboy workout. We’re checking in with him for Week 2 of his challenge. Andrew, how do you feel physically, mentally and emotionally? Physically I feel 100% better so far. I tend to do my workouts in the morning before work so that it keeps my energy up throughout the day. We are getting heavy amounts of snow here and I can really tell when I am doing snow removal, my legs are stronger and my arms are stronger. I also am less tired after shoveling snow. Mentally I feel like I am much stronger. There was some serious stressors going on last week with Christmas, but I pushed right through it and was able to deal with it in a positive way. Thank you for E3 Camu Camu, the kids came home with another sickness and I feel as though if I didn’t have the E3 Camu Camu, I would have caught the sickness and it would have put me behind on my routine. I have noticed that I am getting stronger and able to get more oxygen in my lungs. I am able to complete most of each workout with extra breaks. So far I am meeting my goals. Even with life going on, I was able to complete my workout every day. Join Andrew and do your own E3Live NEW YOU challenge – get a healthy start in 2016! 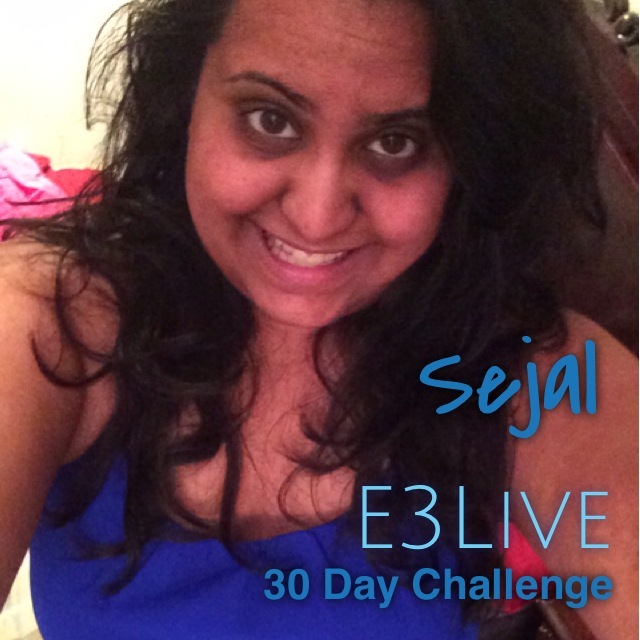 Thanks so much Delores for being our first participant in the E3Live Challenge! She worked out and took E3Live products for 90 days with great success.